Units are aware that the current 10th Bipartite Settlement’s period will end by October, 2017 and the wage revision under 11th Bipartite Settlement will become due from 1.11.2017. So far, even though we have been submitting the Charter of Demands earlier, there has always been delay in concluding the Settlement due to various hurdles during the course of negotiations. This has been creating avoidable anxieties and apprehensions in the minds of members and sometimes even leading to casting aspersions on unions as though the delay is deliberate. Hence, expediting the Settlement in a time bound manner is very imperative. It is good that the Government has advised IBA/Banks to ensure that the wage revision process is initiated early and completed well before the expiry of the current settlement. We welcome this guideline of the Government. Based on this guideline, already Banks have started giving mandate to IBA with the approval of their Board. Vijaya Bank, Corporation Bank, etc. have already given their mandate to IBA. Few more Banks are in the pipeline. Our All India Bank-wise Unions are requested to take up the matter with their management for giving mandate to IBA to discuss and finlaise the next wage settlement on their behalf. 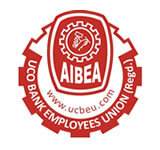 AIBEA has already set up its Sub-Committee with Com. Lalita Joshi (Joint Secretary of AIBEA) as its Convener for preparation of the Charter of Demands and submission to IBA well in time. As in the past, we wish to invite suggestions from all our units so that the Charter of Demands reflects the aspirations of the membership and suggestions of our unions. · Improvement in retirement benefits, etc. etc. Send your suggestions before 15th November, 2016: The suggestions, neatly typed, should be sent to us not later than 15th November, 2016. Thereafter, these suggestions will be discussed by the Sub-Committee and their recommendations will be considered by the Central Committee of AIBEA for finalization and it would be presented in the ensuing Conference of AIBEA before submission to IBA.